ABC will broadcast two Valentine's Day-themed specials on Saturday, February 9, 2013. Be My Valentine, Charlie Brown and A Charlie Brown Valentine will air back-to-back from 8 - 9 PM (Eastern/Pacific time). In 1975's Be My Valentine, Charlie Brown, Charlie Brown hopes for Valentine's cards at the school Valentine's Day party while Linus worries about how to show his affection for his teacher, Miss Othmar. Then in A Charlie Brown Valentine (2002), Charlie Brown tries to impress the little red-haired girl, but instead Peppermint Patty asks him to a Valentine's Day dance. 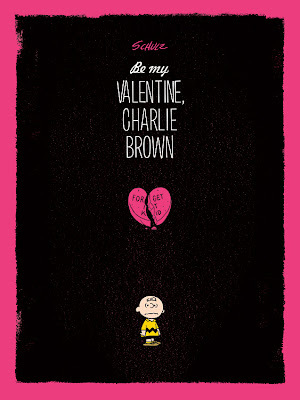 Dark Hall Mansion's first Peanuts prints of 2013 will be two nifty limited edition prints inspired by the 1975 television special Be My Valentine, Charlie Brown. Fans of the comic strip know that Charlie Brown doesn't have much luck on Valentine's Day, and Jayson Weidel's movie poster-style prints deftly illustrate poor Charlie's trials and tribulations with some key scenes from the show - be sure to click the images to see larger versions! 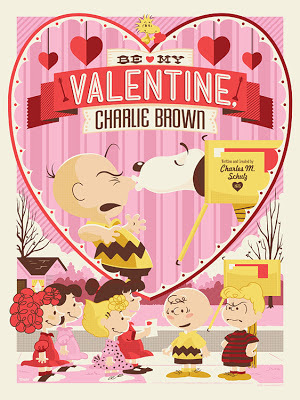 This is the first time Dark Hall Mansion has done prints based directly on Be My Valentine, Charlie Brown. Last year they did release Peanuts prints with a Valentine's Day theme, but they were not based on the television special like these new prints. Both officially licensed, numbered editions measure 18" x 24" and are screen printed. The standard edition is limited to 280 prints, and the alternate edition is limited to 50 prints, and there will be a select wood edition of 5 each of both the standard and alternate artwork on maple wood. The Be My Valentine, Charlie Brown prints go on sale Tuesday, January 22, 2013 at 9:30 AM (Pacific time) at Dark Hall Mansion's webstore. Be sure to be there when the store opens for business - Dark Hall Mansion's limited edition Peanuts prints are fast sellers! Visit Dark Hall Mansion's blog and their Facebook page for more information, larger pictures of the artwork, and behind-the-scenes photos. UPDATE: As of January 2014, these shows are no longer available for streaming on Netflix. Note that the best known specials, such as A Charlie Brown Christmas or It's the Great Pumpkin, Charlie Brown, are not available on Netflix Instant streaming. However, they and many other Peanuts specials are (and have been) available from Netflix as DVDs. This is the first time that A Charlie Brown Celebration and It's an Adventure, Charlie Brown have been made available in a digital format as far as I know; they haven't been released on DVD in the United States or on other online services. Many Peanuts TV specials are also available as digital downloads from iTunes or Amazon Instant Video, although they are only available to buy, not as cheaper short-term rentals. Thanks to Jeremi Smith for the tip!